For a lot of people, mini-ITX happens to be the form factor that lies in the grey area of form factors. This is something that is loved by a lot of people, but at the same time, there are so many people who simply do not want to invest money in this form factor for one reason or another. If you ask us, then we will tell you that mini-ITX is one of the best form factors you can come across. You can easily build a high-end gaming PC using this form factor. However, if you want to save money, and go for something like a home theater PC, that is entirely possible with the mini-ITX PC as well. 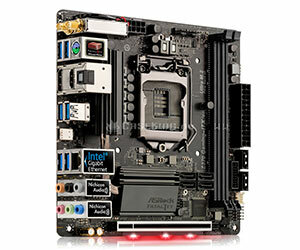 As for now, we are mainly looking at the best mini itx motherboards available in the market. The reason behind that is rather simple, we are trying to facilitate the users into buying the best possible way. That is why in this article, we are going to be looking at the best mini-ITX motherboard. This means that whatever system you are building, regardless of the budget, there is going to be something for everyone. We are going to keep things simple and short as well. ASRock does not need an introduction thanks to some stellar products that they offer us. Whether you are looking for enthusiast grade options, or something affordable, the good thing about ASRock motherboards is that they are always great when it comes to their performance. Today, we are reviewing the ASRock H370M-ITX/ac. A great budget motherboard that gives you decent performance, and good support as well. The perfect motherboard for entry-level gaming PC, or an HTPC. To start with the good things, you get a great, affordable price tag as well. The connectivity on this motherboard is actually fantastic because you are getting USB 3.1, a number of display outputs, as well as dual Gigabit ports, WiFi, as well as M.2 NVMe. If this is not good, then we are not sure what it is. Additionally, the quality of components used in the motherboard is also amazing to a point that you won’t have to worry about any issues as well. The motherboard has clean design and looks, making it pleasing to look at the option. If you are looking for the downsides, there is not much. However, you must know that there is a pretty aggressive CPU power restriction that is onboard. The bios do not give you any options such as voltage adjustment, and the audio codec is nothing to write home about. Overall, the ASRock H370M-ITX/ac is a great budget-oriented motherboard. It focuses on making sure that the performance is properly given. The motherboard is simple and easy to use without much of a hassle. It is a great buy for anyone who happens to be on a budget. The design language is simple and not overstated. 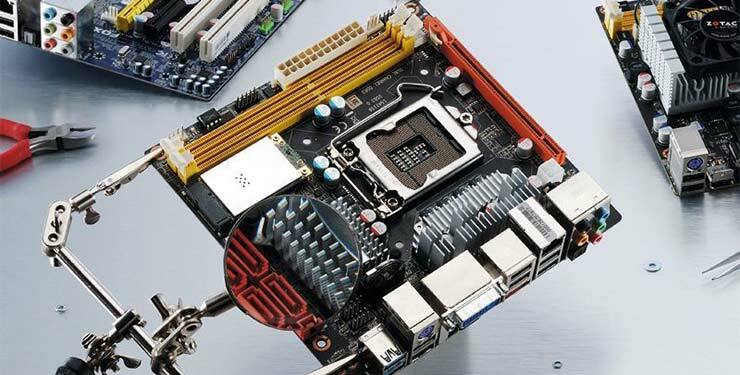 The components used on the motherboard are of great quality. The CPU power limitation can be an issue for some. No voltage adjustment in the bios. There is no denying that Asus has earned quite a name for themselves when it comes to some amazing gaming components. Whether we are talking about graphics cards, or when we are talking about motherboards, Asus has you covered. Today, we are reviewing the ASUS ROG Strix H370-I Gaming. A budget-oriented gaming motherboard that comes with some amazing features up its sleeve. Is it good enough to earn the spot in our list? That is exactly what we are going to find out in this article. So, let’s not delay any further and have a look. Now moving on to the good things, the first thing that you must know is that the motherboard comes with a brand new WiFi controller. I know it might not sound like a lot, but the good thing about this controller is that it can achieve faster speeds. The motherboard looks great and small. 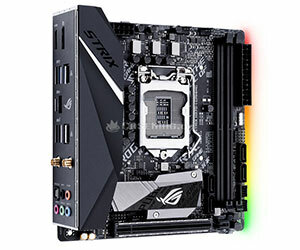 It offers a solid design language that is synonymous with Asus’ Strix series of motherboards. On such a small motherboard, you also get dual M.2 slots making it a great purchase for many people. The motherboard is also a looker and gives away the vibe that we are so in love with. Last but not least, the triple USB 3.1 goodness is something that we cannot avoid at any costs. As far as the downsides are concerned, I have to be honest, it is nearly impossible to find something wrong with this motherboard because everything about this motherboard is near perfect. You get great performance through and through, and the looks are served as well, making this motherboard a great purchase for everyone. Overall, the ASUS ROG Strix H370-I Gaming is a great motherboard that everyone should buy. The best part is that it does not even cost a lot of money, and still offers great performance. ASRock is back with another amazing product that you can buy in the market. The good news about this motherboard is that it is made for people who are looking for top of the line performance and are not worried about spending money either. Although the motherboard is not that expensive, it still has a lot of amazing features. 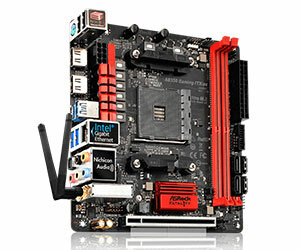 The motherboard in question is the ASRock Fatal1ty Z370 Gaming-ITX/ac. What is so good about this motherboard? Well, that is exactly what we are going to find out. So, let’s not delay it any further and have a look, shall we? First things first, the motherboard provides excellent overclocking. Something that most people completely overlook when it comes to this mini-ITX motherboards. Coupled with the right CPU cooler, you can achieve some amazing scores as well. The good thing is that even after being overclocked, the motherboard can maintain its stability, and works as efficiently as possible. The motherboard also comes with a high-end Wi-Fi and Bluetooth controller, so you are definitely getting something good here. The motherboard also comes with Thunderbolt 3 connectivity, making it one of the highest end ITX motherboards available in the market. With all the good things aside, there are a few shortcomings that you should know about this motherboard. For starters, you only get one M.2 slot, and for some reason, Type C is the older one, which only offers 20 gigabits per second speed. Overall, the ASRock Fatal1ty Z370 Gaming-ITX/ac is a pretty good motherboard that offers great performance, ease of access, and most importantly, it does not cost a lot of money either. If you are looking for a motherboard that can offer good overclocking at an affordable price tag, this is the way to go. Good for all sorts of builds. The motherboard only has one M.2 slot. By now, it is fairly evident that when it comes to mini ITX motherboards, ASRock is doing a pretty good job of giving us some amazing options in the market. This does not change again as the company is back with another motherboard, this time it is built for budget AMD users in mind. We are presenting you with the ASRock Fatal1ty AB350 Gaming-ITX/ac, an affordable solution for those who are planning to build an AMD focused system. How good is it? Let’s find out. To start off, I really love the fact that the UEFI experience of this motherboard is among the best. UEFI is important, so it is not something that you leave out because you think it is not going to be necessary. You can use Ryzen processors with up to 8 cores and still get some great performance. The wireless connectivity is solid and works brilliantly. The build quality of this CPU is also amazing and should get the job done in all the cases. The overall build quality and aesthetics of the motherboard also look great. As far as the downsides are concerned, the bios can be a bit quirky for some, but the thing that bugged me the most is that there is no POST LED available on the motherboard. Handling the bios can be a bit difficult. How can a list of motherboards be complete without something from MSI? The company has been providing us with some excellent hardware ever since they stepped into the market and nothing is going to change that. The same goes for today’s offering. Today, the MSI Z370I GAMING PRO CARBON AC is here to grace us with its presence. The last motherboard on the list has some really impressive shoes to fill. Can it succeed? Let’s find out. The best thing about this motherboard is that it offers amazing performance, and the overclocking prowess is enough to rival some of the ATX sized competitors. Additionally, if you want to overclock your RAM, you can easily do that as well, and the best part is that the motherboard offers great efficiency as well, so you do have something to look forward to. There are not many connectors available on the motherboard, so, that certainly is a great way to make sure things are not as crowded. However, MSI’s decision to remove the headers is somewhat of a controversy. For starters, the motherboard only has one M.2 interface, but it does not support SATA. There is only one case fan header available on the motherboard. For me, the MSI Z370I GAMING PRO CARBON AC is one of the best motherboards available in the market, and for all the right reasons. It is affordable, has some great features, and the best part is that it can overclock as good as a full sized motherboard. I do not see any reason why this motherboard would not get the attention it deserves. Top of the line overclocking. Very efficient in terms of overall performance. 2 does not support SATA. There is only one case fan header. 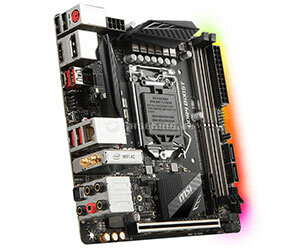 For anyone who is looking for great mini ITX motherboards, the good thing is that this list is made for them. As I have talked about before, the mini ITX is an area that many ventures in. Not because these are not great, but mainly because when it comes to these motherboards, finding the right hardware can be difficult, and that is most people stay away from mini-ITX builds. However, the important thing that you must know about these motherboards is that they are great in almost every single task that you throw at them. 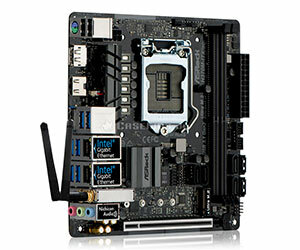 That is why decided to take a look at the best mini-ITX motherboards available in the market. The roundup only talks about a few products for the right reasons. We did not want to confuse the buyers as to what they should go for. That is why we thought it would be a good idea to keep the motherboards to a limited number, so the consumers do not have a problem finding the right option for them.